Thank you Southbury Juniorettes from the Southbury Ambulance Association (SAA). Your donation is greatly appreciated and will help us continue to provide high quality Emergency Medical care right here in Southbury. Founded in 2004, The Southbury Juniorettes, a community service oriented nonprofit, have actively volunteered to support both local and national organizations whose mission is to address societal needs ranging from health and education to food and shelter. On February 10th, a bake sale was held at Stop and Shop and Southbury Ambulance was the grateful recipient of the bake sale proceeds. 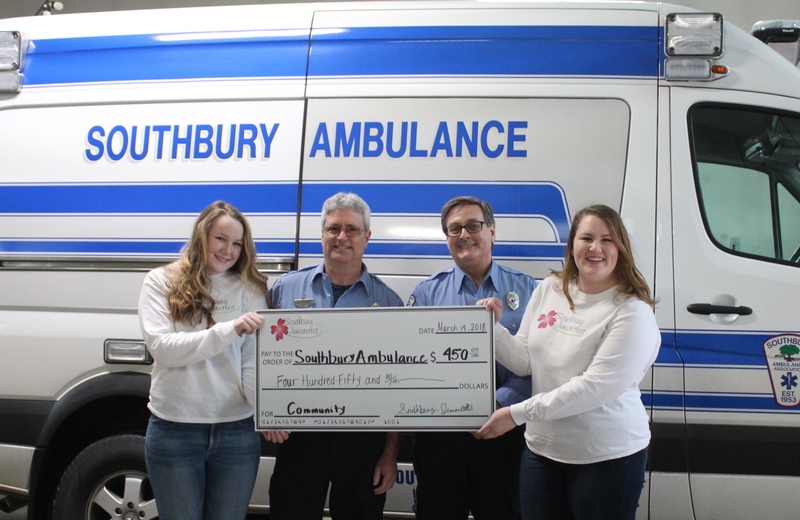 Presenting the check to Southbury Ambulance volunteer EMTS are the Juniorette Co-Presidents Laura Lee and Molly Dinsdale both PHS seniors. Pictured from left to right: Laura Lee, Bruce Pearson, Lee Dierdorff, and Molly Dinsdale.